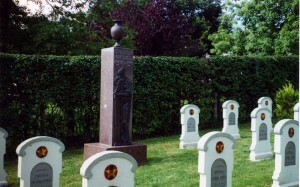 Alexander Burganov is an author of a number of monuments to Soviet soldiers in Belgium. In smaller towns, Louvain, Namur, Quant, Liege, Buchenbah, March-au-Pont. These sculptures have particularly lyrical and spiritual formation. The author managed to convey heartfelt personal experiences on the background of the great tragedy, which was the war for all countries and peoples. 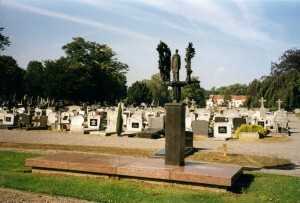 According to reports in Belgium, the country has buried from 350 to 600 Soviet citizens. Basically – these are Soviet prisoners of war, or citizens of the USSR exported during the war to work in the mines of Wallonia. Many of them fled from captivity and joined the troops of the Belgian Resistance. At present, there are precise data on the 300 buried in the territory of the Kingdom. Many of the graves still remain anonymous, due to the lack or loss of archived data. 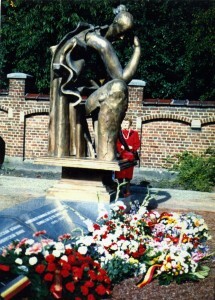 Unfortunately, in 2012, as reported by ITAR-TASS press-secretary of the Russian Embassy Georgy Kuznetsov, a Soviet war memorial in the village of Marsh Pont, district Charleroi Hainaut province a bronze sculpture work made by Russian sculptor A.N. 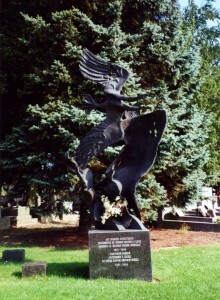 Burganov, installed at the municipal cemetery of the Marsh-Pont in 1989 on the site of the burial of ten Soviet prisoners of war who died in Belgium during the Second World War was kidnapped. 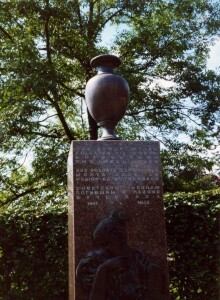 The Russian Embassy sent a note to the Foreign Ministry of Belgium and letters to the leaders of Parliament, the Ministry of Interior, Ministry of Defense, veterans’ organizations, local authorities, demanding a speed investigation and return of the monument. Belgian police is investigating the incident. 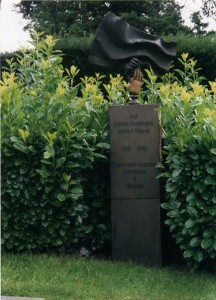 According to one version, the sculpture was stolen for a private collection because its author Alexander Burganov is well known in Belgium. In Brussels, you can see his other works, such as monuments of the Russian Emperor Alexander I and the founder of the Belgian royal dynasty Leopold I.